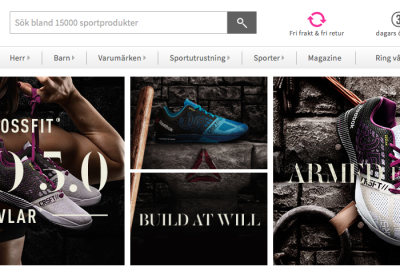 Sportamore is growing rapidly – in the second quarter reports the online sports store a growth of 51 percent compared with 2014. “The segment Other Nordic countries now represent 34 percent of sales, a significant increase on previous periods,” said CEO Johan Ryding. Net sales amounted to 131.5 (87.0) million SEK in the second quarter, which is a sales growth in the period of 51 percent(24%). Operating profit amounted to -11.0 (+0.4) million SEK. Net sales are now up to 235.2 (167.7) million for the first half in which the operating result amounted to -27.5 (-1.0) million. “The second quarter has meant a sharp increase in growth rate compared with the previous quarter and previous year. It is clear that our intensified marketing efforts have had the intended effect. Our commitment to deliver the best service offering and to take care of our new and existing customers in the best way, has continued and today 37 percent of our total customer base return within 90 days after the previous transaction to make their next purchase. This is a confirmation that our service-oriented business model is appreciated by our customers, ” writes Sportamore’s CEO Johan Ryding in the interim report. The decline reflects, according to the report, calculated and substantial further investments in the acquisition of new customers in all markets. “We have a well-functioning customer acquisition model in all Nordic markets and believe we are well positioned for continued growth. The company has a strong financial position and an organization whose capacity and efficiency provides a good platform for further growth-oriented investments, ” says Johan Ryding.